Bevel gears are most often used to transmit power at a 90° right angle. The axes of the two gear shafts intersect and the tooth-bearing faces of the gears themselves are conically shaped. Bevel gears are most often mounted on shafts that are 90 degrees apart.Bevel gears are generally divided into 2 types, straight bevel gears and spiral bevel gears. 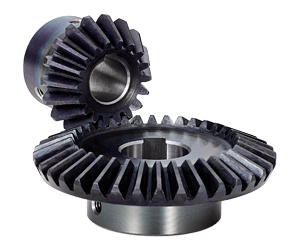 In Straight bevel gears, the teeth are straight and parallel to the generators of the pitch cone. 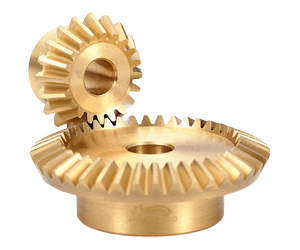 Compared with spiral miter gears, straight bevel gears can be made in smaller sizes. We standardized Straight bevel gears as small as module 0.5 in various materials. 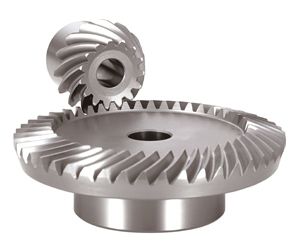 Spiral bevel gears have their teeth formed along spiral lines. They are somewhat analogous to cylindrical type helical gears in that the teeth are angled; however, with spiral gears the teeth are also curved. 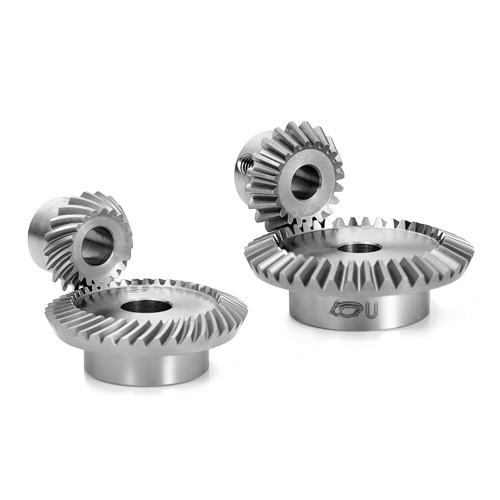 Spiral bevel gears have a strength, oscillation and noise level advantage over straight bevel gears. 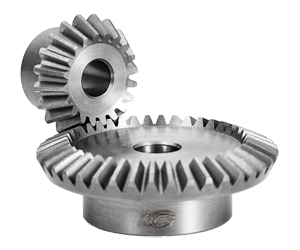 The disadvantage of Spiral bevel gears is that they produce an axial thrust load. Therefore proper bearing location and firm support are required for their assembly. Our standard Spiral bevel gears offer 1:5 , 1, 2:1 and 3:1 gear ratios. Now you are able to check the dimensions of our standard Bevel Gears through our PDF catalog or our Gear selector provided by Part Community. Free CAD data is available on the website. Click the logo below to access the Miter Gear Selector. 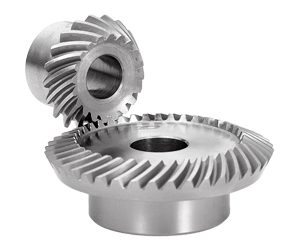 Please request your Quotations for our Bevel Gears through our “Request For Quotation” page. 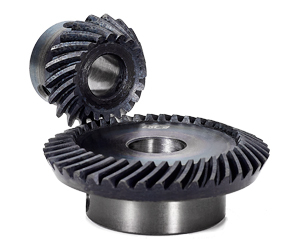 We can customize our standard Bevel Gears to suit your specific applications, please consult with us. We are offering gear modification services. Please check the details and examples of modifications at our“Gear Modification” page. Please refer to the following precautions before using our Bevel Gears. SUS304 stainless steel has better corrosion resistance than 303 stainless steel. 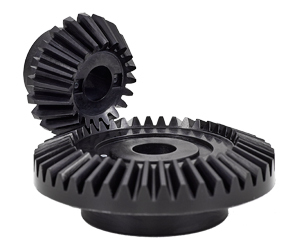 Competitive price molded bevel gears.